Jean Ann Morrison, 81, of Cincinnati, Iowa, passed away at 4:20 a.m. on Monday, March 18, 2019 at Heartland Health Care Center, Moline IL. Jean was born on December 21, 1937 to Glen Morrison and Ruth (Weldon) Morrison. She graduated from Cincinnati High School with honors and then attended Centerville Community College earning an Associates Degree. She was a high school cheerleader for four years; and, during her senior year, her youngest brother, Allan, was also a cheerleader. Jean spent her working career in Rock Island, Illinois, retiring from John Deere accounting in 1992 and relocating to her parent’s small farm in Cincinnati, Iowa. She became actively involved in her community and church and was mayor of Cincinnati for many years. One of the true loves of her life was travel with close friends and family. She toured much of Europe, the Middle East, Canada, and most of the USA. She loved gardening and her cats; and was considered the go-to person for the family history of both the Weldon and Morrison families. 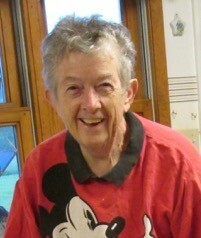 Jean is survived by her brother Neal Morrison, Aunt Greta (Weldon) Gall, and several cousins, nieces and nephews. Jean was especially thankful for all the recent caring and help extended to her by her sister-in-law Jan Morrison, niece Diane Feddema, nephew David Morrison, cousin Randy Mullenix, and close friends, Elaine and Roy Logsdon. Jean was preceded in death by her parents, and brothers Allan and Don Morrison. Funeral services will be held at 11:00AM, Friday, March 22, 2019 at the First Christian Church in Cincinnati, Iowa, with Pastor Kay Singley officiating. Burial will follow the service at Pleasant Hill Cemetery in Cincinnati. A Visitation will take place on Friday, March 22, 2019 at the First Christian Church in Cincinnati, with the family greeting friends from 10:00AM-11:00AM. Memorials have been established to the First Christian Church, and may be mailed to Lange Funeral Home and Crematory, 1900 South 18th Street, Centerville, Iowa 52544. Condolences may be shared online at www.langefh.com. | 1900 S. 18th St.
| 103 N. John St.